I think the reason why seeing my mess/clutter makes me so anxious, is because it has become a odd reflection of what my life looks like, and that is 'pretty messy'. Messy doesn't always have to be negative. It can be evidence that you're actually out there LIVING, but when the 'messy' starts to creep in and steal your joy... then YEP... it's definitely a problem we should try and clean-up. "INHALE. ACKNOWLEDGE what you are feeling. EXHALE. Let go of anything that isn't serving you here in this moment." What you feel is IMPORTANT. Those are your feelings. Your emotions. What you FEEL is an aspect that makes you, YOU. But what we feel can't be the end-all-be-all. If this was true, what about out stress and anxiety? Stress and anxiety, although CAN BE a good kick in the booty, doesn't always serve us, but rather weighs us down and get's in the way. In order to fully experience the moments in life, we need to EXHALE + let go. With the help of my friend Leah (one of our very talented MAMBI Designers), I have created this cute little challenge: Spring Cleaning // A SEVEN DAY PLAN TO A HAPPY + HEALTHY LIFE. ALRIGHT... So I've broken this idea of SPRING CLEANING into three parts: MIND, BODY + SPACE. For the next 7 DAYS, you will have a few to-do's from each category. Now you can begin whenever you'd like. I, personally, will begin the challenge March 10th- March 16th, so that I can PREP for the official FIRST DAY of SPRING (Tuesday, March 20th!) Yay! So what's in each category + what do they mean. Well, I'll tell ya! MEDITATE: Spend at least 5 minutes a day breathing, praying, and/or finding stillness. JOURNAL: Get your thoughts on paper in your Happy Planner®. Each day ask yourself three simple + straightforward questions, 1. How am I feeling today? 2. What is causing me stress and/or anxiety, and how can I choose to LET GO of these negative feelings? 3. What am I grateful for today? SOCIAL MEDIA: Decide whether you want to limit your time on social media OR detox completely for the next 7 days. Limit your time spent scrolling by turning on a timer. Track the number of minutes spent on each platform. This will make you aware of 'empty minutes' that could be used elsewhere. EATING: What you put into your body is FUEL. For the next 7 days say NO to all ADDED SUGAR. Trust me, you’ll feel much better. Stay hydrated by drinking at least 8 cups of H20 a day. EXERCISE: Move your boo-tay! When you exercise your body releases endorphins. Elle Woods once told us, “Endorphins make you happy!" And who doesn't want to be a little HAPIER! Try to move your body for 30-60 minutes a day. AFFIRMATION: You are STRONG! In the morning when you wake-up, and at night before you go to sleep, give yourself a little pep-talk. Tell yourself at least ONE positive affirmation. CLEAN: Where are the places in your home or workplace that are causing you extra unnecessary stress? 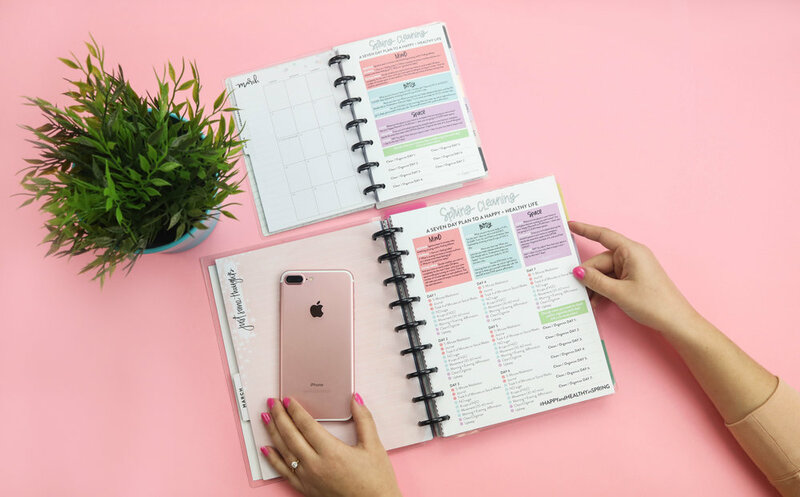 Use your Happy Planner® to PLAN how + when you are going to CLEAN these spaces. ORGANIZE: Once you’ve finished cleaning the stressful spaces in your home or workplace, decide the areas that need a little EXTRA attention. Organize the heck of it, and you’ll feel GREAT! UPKEEP: YAY! You did it! Now that your space is neat + clean, try your very best to keep it nice + tidy for the next 7 days! You will have a section on your download to decide what you want to clean and/or organize each day! Let's take advantage of this Springtime tradition, and let go of the things that are no longer serving us, while dusting off all the things we do love. Let's hit the RESET button TOGETHER, as we continue to plan a HAPPY + HEALTHY 2018. Will you join me? Comment below! Are you going to ADD any other elements to your 7 Day Challenge?! Share your 7 DAY Challenge journey on social media by using the HASHTAG #HAPPYandHEALTHYinSPRING and tagging ME (@hannahjoyyyy).